According to the American Lung Association, lingering wildfire smoke may pose a serious health problem to large segments of the US population. This photo was taken . . . of the . . . by . . . courtesy of . . . .
Public health. These are some of the most overlooked and potentially costly areas associated with wildfire (and resultant smoke) damage. In addition to fatalities, wildfire smoke inhalation is known to cause and exacerbate a wide range of human health problems, including asthma, emphysema, and heart disease. Medical equipment, health-related evacuations, and ambulance charges are some of the direct health costs related to wildfire. Indirect costs include health insurance premiums, pre-fire medical equipment purchases, and medical personnel training. Post-fire costs include continuing health care, insurance premium adjustments, health-related work absenteeism, survivor benefits, and even funeral and burial costs. Douglass, Rachel 2008. 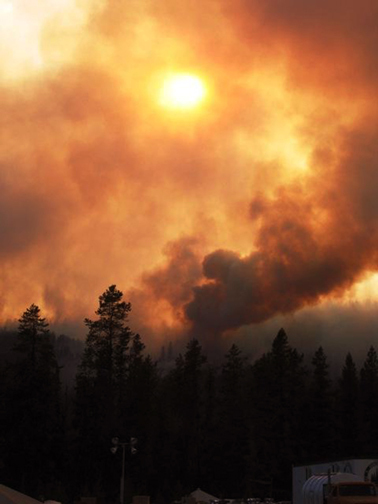 Quantification of Health Impacts Associated with Fine Particulate Matter due to Wildfires. Masters thesis, Environmental Management, Duke University, Durham, North Carolina: 45 pp. Fann, Neal, Charles M. Fulcher, and Bryan J. Hubbell 2009. "The influence of location, source, and emission type in estimates of the human health benefits of reducing a ton of air pollution," Air Quality, Atmosphere, and Health. Springerlink.com, Springer (June 9) 8 pp. Hope, Bruce K. 2005. Health Effects from Exposure to Smoke. Air Quality Division, Oregon Department of Environmental Quality: 15 pp. © 2009 Oregon Websites & Watersheds Project, Inc. and Western Institute for the Study of the Environment.